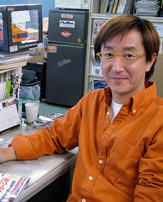 Fuyuhiko Yoshimura currently serves as the chief editor of Option Magazine beginning in 2001. As a former chief editor for Drift Tengoku Magazine, he is a vital presence in the Option group. His personal car is a simple, yet sophisticated yellow Z33 that is slammed to the ground. While the bored automobile market craves for some excitement, Nissan announced that the GT-R Proto model will be debuted in 2007. Everyone has been waiting for the release of this vehicle which will definitely be a historical happening. Rumors of the vehicle configuration have been widely spreading all over the world, from a V8 twin turbo motor setup, a 7 speed gearbox, to a FR transaxle, emphasizing the great anticipation of this machine to the market. At last, the day of the prototype announcement was here. To everyone's disappointment, only the body design was displayed and no information about the vehicle layout was released. I assumed that a car like the GT-R was first prioritized on the overall mechanics and performance, shaping the body around that aspect, not the other way around. I understand that this new model was relieved of the "Skyline" name and set free to take its own shape, but that might have some reverse effects. It seems like the special ness of this model is not there. For example, all throughout history, the Skyline GT-R carried a special meaning behind it because there existed the lower models, the GT and the GTS. The R badge was the superior version of the Skyline, making it special. The new GT-R has no base car and is not a Skyline, making the model independent. The traditional evolution of the Skyline has been interrupted in this era. The best characteristic of the Skyline GT-R was that it emphasized on functionality over form. The wide open front end design provided cool air to the engine even though it created lots of wind resistance. The monstrous wing obstructed the rear view but provided monstrous downforce. The fenders were designed so that the best tire setup would fit on the car. These were the best features that the Skyline GT-R was known for. All the car enthusiasts seem to be thinking the same. The argument between the base model and the "R" and its relationship to the specialties. This is where the tuning comes in. We customize our cars so that it will become special to us. Whether the goal is to make your car faster than the base model, the motive doesn't matter. What matters the most is that people can have tuning their cars to their own definition of an "R". Lately, I've been hearing that the tuning car industry is dying down and there is no future ahead. Some aspects of that may be true, but my feeling of not wanting to believe that is strong. It's hard to believe that the number of people that are into tuning cars are declining. The tuning car culture is evolving in parallel to the changing era and is becoming divided into two parts. One is the extremely modified cars in the traditional platform and the other is the lightly modified version of the new vehicles that are available in the market. The tuning approach have changed, for example, to make a fast vehicle in the past turbo or complete engine makeovers were performed. In this generation, the cars are able to go just as fast with simple ECU tuning. The extremely modified cars of the traditional base are the ones that I feel are the dying breed. In fact, I see a decline in the number of cars that participate in drag racing or time attack compared to the previous era since the uprising of the newer cars. The latter example of the modern, lightly modified cars appeal towards the adults of the market. These vehicles are street legal, safe, and cool looking with lots of varieties to choose from. The vehicle style that was unheard of 10 years ago now competes head to head with the European auto manufacturers. This is not a period of a dark cloud, but a changeover. Since the early times, the modern cars are expected to drive fast and be efficient. On top of the speed and performance features these vehicles already come equipped with, the manufacturers are emphasizing on different aspects for the people. Rather than overall response, the cars are designed to feel good. The general people do not want power and speed like they did in the past, so the cars are evolving. The direction the automobile design and the people's opinions have dramatically changed since 10 to 15 years ago. Since a number of vehicles with complex high-tech devices like the VSC are increasing, we have to consider how to deal with those safety devices instead of avoiding them. As a result, I am sure that the automobile electronics industry will rise to meet the demands of the public. This will be a big topic in the future since the high performance Japanese cars with over 300hp are starting to show up in the market. 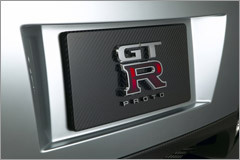 In 2007, the tuning industry will reach its peak with the appearance of the new GT-R. 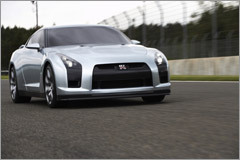 The question is whether the GT-R has the potential to be tuned to the owner's expectations and live up to this era. Additionally, outdated tuning will not be applicable to this car. Anyways, I would like to say in the end is that "We, OPTION magazine, will keep up with the tuning industry and will always do what we've been doing all this time "